Belgrade, Serbia - His Eminence Archbishop of Cetinje and Metropolitan of Montenegro and the Coastlands Amphilohije served the Holy Hierarchical Divine Liturgy on Lazarus Saturday at the newly established chapel at the Military Medical Academy in Belgrade, dedicated to St. Luke, Archbishop of Simferopol, the newly canonized Saint, surgeon, painter and archbishop of the Russian Orthodox Church of the twentieth century. His Holiness Patriarch Pavle of Serbia also took part in the Liturgy, who prayerfully celebrated his Krsna Slava. 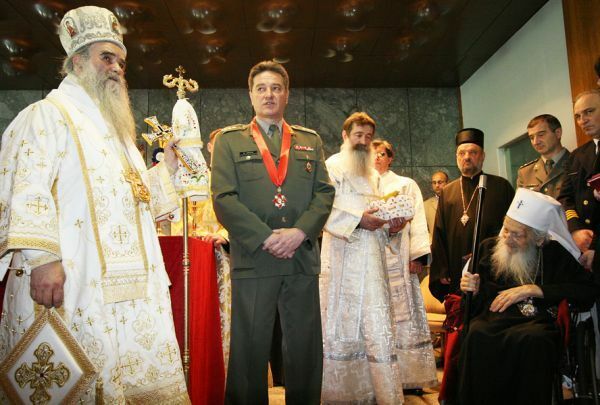 Bishop Vasilije of Zvornik and Tuzla also attended the Divine Liturgy, together with the Serbian Minister of Religion Bogoljub Sijakovic, Mladen Djordjevic Advisor to the Serbian President for Kosovo and Metohija, Assistant to the Minister of Interior Affairs Damjan Krnjevic, member of the Royal Council Dragoljub Acovic, Professor Vojislav Milovanovic as well as a large number of employed military physicians and patients of the Military Medical Academy, headed by General-Major Dr. Miodrag Jevtic, head of this establishment. Assisting the Archbishop at the service were Protojerej-stavrophor Savo Jovic, Protojerej-stavrophor Vladimir Vuksimovic, Hieromonk Methodius (Ostojic), Fr. Nebojsa Topolic, the dean of this Chapel, as well as Protodeacon Stevan Rapajic and hierodeacon Jovan (Panic), and in attendance were Archimandrite Jovan (Radosavljevic) and Danilo (Ljubotina), spiritual father of the Chapel Protojerej-stavrophor Ratko Savic, Mother Anastasija, Abbess of the Monastery of the Entrance of the Theotokos, together with the sisterhood and many more faithful. 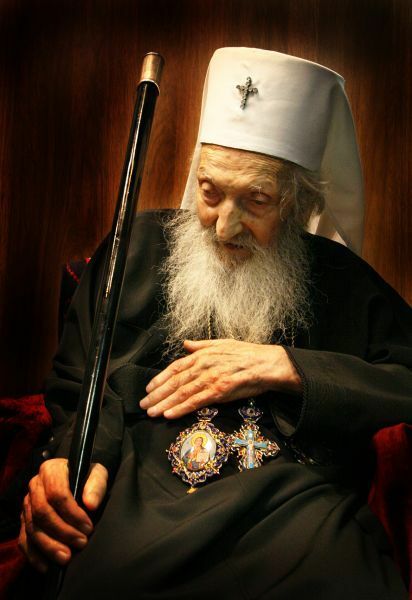 Following the Holy Mystery of Communion, Metropolitan Amphilohije performed the Rite of the Cutting of the Slava Kolach for His Holiness Patriarch Pavle, congratulating him on his Krsna Slava and wishing him a long and healthy life and all good things from the Lord. Afterwards the Order of St. Sava in the Second Degree was granted to Miodrag Jevtic for his witnessing of Christian love and humanity. The liturgical celebration ended with a meal and congratulatory words to His Holiness.